Genetic testing may also provide important information. The University of Chicago Medicine Cardiovascular Genetics Clinic offers comprehensive testing, counseling and treatment for patients who have been diagnosed with a genetic heart condition as well as for high-risk families and individuals. While there is no cure for connective tissue disorders, proper medical management can help control symptoms and allow patients to live full, long lives. Depending on the severity of the disease, heart valve repair or replacement may be necessary. Connective tissue is a term that refers to the network of proteins that holds together our muscles, bones, organs and skin. This includes tendons, ligaments, cartilage, bone and other body tissues. 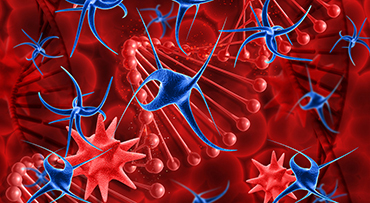 Connective tissue diseases are inherited conditions that affect the proteins of these tissues (particularly the proteins fibrillin and elastin), which results in the connections to the organs they support becoming looser. When there is a concern of the connective tissue within the wall of blood vessels, a pediatric cardiologist helps in the diagnosis and treatment of these patients. Marfan syndrome and Ehlers-Danlos syndrome are two of the most common connective tissue disorders; both can impact a patient's heart and vascular system. Marfan syndrome is caused by mutations in the fibrillin 1 gene. These genetic mutations produce proteins in the connective tissue that do not function properly and can lead to abnormalities of many parts of the body, including the skeleton and the eyes. This poorly functioning protein can lead to problems with the functioning of heart valves, including leakage of the aortic or mitral valves, called “insufficiency” or “regurgitation.” When the connective tissue in the wall of blood vessels is affected, people with Marfan syndrome can develop an enlarged aorta, which can lead to aneurysm and life-threatening rupture. Early diagnosis and medical management is key to slowing the development of aortic enlargement. 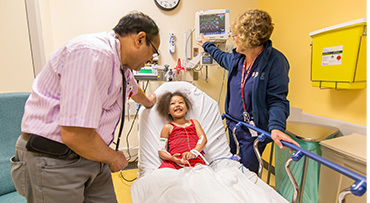 Comer Children's is home to a multidisciplinary Marfan Syndrome Clinic, where cardiologists collaborate with orthopaedic surgeons, ophthalmologists, geneticists and other specialists to provide the most advanced, comprehensive care possible. Ehlers-Danlos syndrome is often caused by mutations in the COL5A or COL3A genes. These genetic mutations affect the body's connective tissue and can lead to loose joints, and soft, velvety skin. A severe subset of this genetic disease, known as vascular Ehlers-Danlos syndrome, can weaken the aorta, which in turn can lead to aneurysm and life-threatening rupture. Early diagnosis and medical management is key to slowing the development of a weakened aorta. Other genetic syndromes associated with heart disease include Down syndrome, William syndrome, Noonan syndrome, Turner syndrome, storage diseases and cardiomyopathies (diseases of the heart muscle). Congenital heart defects and some valve disorders also are inherited genetic cardiovascular diseases. UChicago Medicine's Cardiovascular Genetics Clinic offers comprehensive diagnostics and advanced treatment for all forms of inherited cardiovascular disease. This painless, non-invasive test uses sound waves to check the heart's structure, movements and blood flow. This interventional procedure is used to diagnose or to treat heart defects, including arrhythmias, congenital heart disease, valve disorders, heart failure and more. 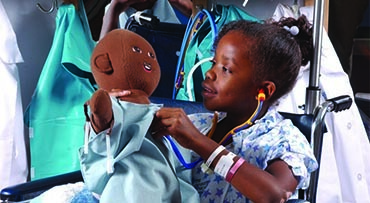 Our advanced surgical options for congenital or acquired disease are available to children of any age, even the tiniest of newborns.